I was trying to take care of some paperwork for school today so I was browsing around the Wayne State webpage. I ended up on their PhD students webpage. 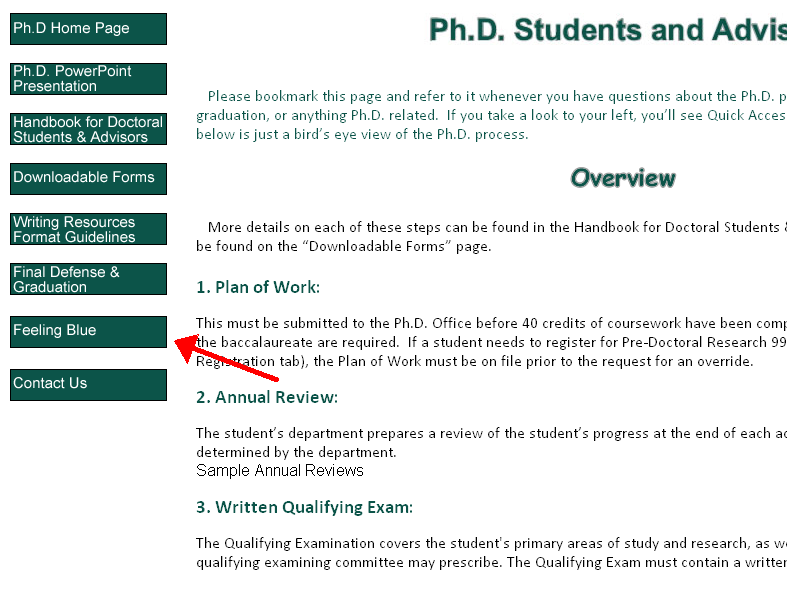 This page contains forms and information that all PhD students at Wayne State will need. There are timelines of what needs to be done when, forms you will need to fill out, oh and what is that there at the bottom? Feeling Blue? I wonder what is behind that link. Oh yes, depression counselling. So included with all the other forms and stuff you need to know, a helpful link to the school counselor and what looks like a dedicated support group for PhD students. It is nice to know that depression is a an inevitable consequence of getting a PhD. My only question, is this limited to getting the PhD or does this extend to having a PhD also?